Capetonians sighed in disbelief when Mario’s Italian restaurant had a disastrous fire and had to close, two soccer matches into the Fifa World Cup. Their prime location within metres of the Green Point stadium entrance gates was supposed to boost their winter profits during eight matches. Pina Marzagalli’s late husband Mario opened in Green Point in 1975 when their daughter Maralena was only two days old. Pina came in one day to help out. And thirty-five years later, she can be found in the kitchen on most days. Daughter Maralena has taken over the fresh pasta and desserts; son Marco handles much of the rest. The food includes classics such as ravioli in sage and butter, marrow bones on toast, and slow-roasted oxtail. Dependable, old-style dishes that aren’t always perfect. Regulars don’t seem to mind. Offal is a speciality – favourites include kidneys slow-roasted in their own fat, sweetbreads and brains. Homemade semi-freddo ice-cream with almonds and a generous splash of Amaretto is a signature dessert. Mario’s service is family-run and functional with no attempt at gloss. Some customers routinely bring their own wines. The restaurant re-opened during the first week of September. What’s new? Only one original scribbled pillar survived the fire, now keeping company with dated maroon patent leather chairs and white tablecloths. Stylish light fittings, a fresh lick of cream paint and a brick pizza oven ring in the changes. It took some persuading to get Pina to agree to offer pizza, but she’s already seen the difference in the bottom line one week after re-opening. The pizzas are good. A smear of tomato sauce, the right amount of mozzarella cheese and a scattering of toppings on a thin, crispy base. 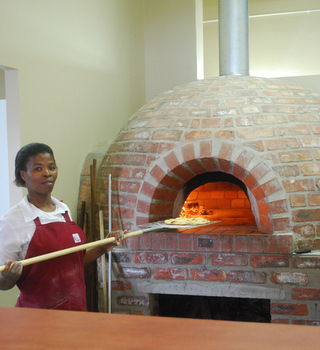 Pizzas start with garlic and herb-laced foccacia (R28). A Margherita (R45) has fior de latte cheese on request at an additional R10. 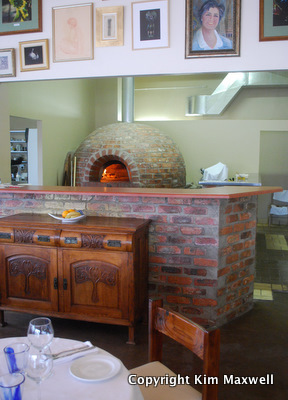 Traditional toppings include ham-and-mushroom Regina, olive-and anchovies Napoletana or ham-olives-artichokes-and-mushroom Quattro stagioni, ranging between R50 and R72. The Prosciutto pizza we tried (R72) ticked all the boxes with its crispy base, pleasant ratio of tomato sauce to cheese, quality thin Parma ham slices and fresh rocket leaves. MARIO’S ITALIAN RESTAURANT 89 Main Road, Green Point. Open Mon to Sat. Tel 021 439 6644.